Of course you have to compare the small number of deaths on that hike over many, many years (20 on dome, 60 on trail) with the huge number of people who *survived* their hikes, as I think we did (assuming no parallel universes where we didn’t survive), to get a reasonable risk calculation. 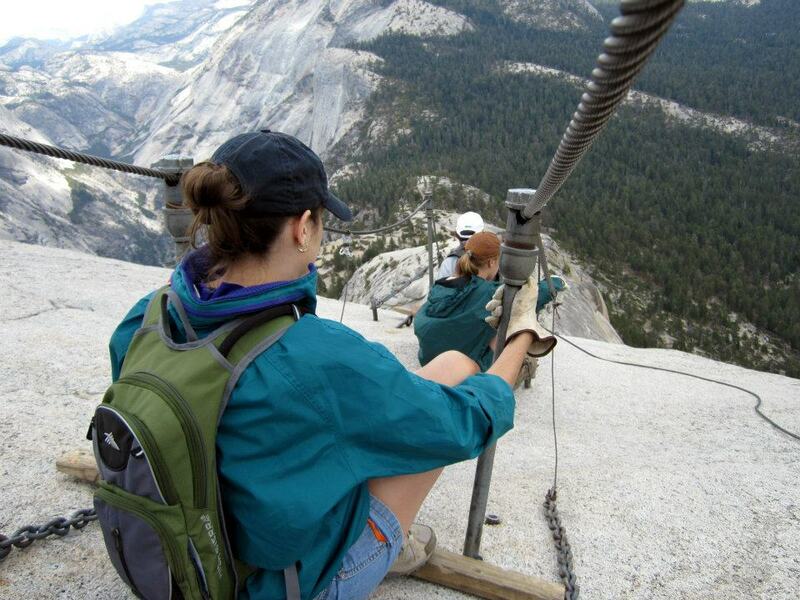 You also need to compare that risk to other risky things we do, such as *drive to Yosemite*.I wanted to try a shot at calculating which is more dangerous – the drive to Yosemite from Oregon, or the most intense part of the hike up Half Dome – the cables. Now we need to estimate the number of people who have made it up there as we did. Ranger guy below the dome and internet tells us it is now about “350-400 per day”. That would be current high season with permit restrictions so hard to know the past until I can find more records. But we know that the low season (winter) is about 0 per day. Probably far fewer people in 1919 than now, so let’s *wildly guestimate* that on average, since 1919, 100 people per day go up, and that almost all that traffic is during the high season of June, July, August, September when cables are elevated with the metal rods (in the past and in winter they lay flat on the surface). 100×120 days = 12,000 people up per year. 90 years of cables x 12,000 = 1.08 million ascents of half dome over 90 years. ROUND THIS WILD GUESTIMATE to one million people up half dome over all of human history. We now have 1,000,000 people who went up and 999,980 people who come safely back down. 20 of the million, sadly, died on half dome. Thankfully, every single one of us remains in the 999,980 group of happy Half Dome hikers. “For every 50,000 people who go up the final portion of the half dome hike … one will probably die”. For extra drama we might note that we had 6 people on the hike so the (pre-hike) odds that one of us would die were 6/50,000 or 1 / 8333. The chances of dying during 900 miles of car travel in California: 900 x [1.21 / 100,000,000] = .00001 deaths per Yosemite trip. So if all these assumptions are pretty reasonable, than we can state that the half dome portion of the hike with its one in 50,000 chance of death, is about twice as dangerous as the car ride with its 1 in 100,000 chance of death. This entry was posted in california, National Parks, wilderness, Yosemite and tagged half dome deaths, half dome hike, hiking risks, travel risks, wildnerness risks, yosemite hike. Bookmark the permalink. Calculating death — interesting article. I had been wanting to make that half dome hike up until today. 🙂 Good luck. It’s actually a great and useful piece of info. I am satisfied that you shared this useful information with us. Please stay us informed like this. Thanks for sharing. This really is one of the best Muscle Building supplements there’s. sure you are not one of them. If you wish for to obtain a great deal from this piece of writing then you have to apply such techniques to your won weblog.